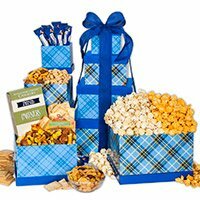 GourmetGiftBaskets.com Father’s Day Gift Tower is full of snacks dad will love with this four-tier tower that is arranged so neatly in plaid boxes you get Buffalo Popcorn by KingOfPop.com in a 1.5 oz. crisp, handcrafted gourmet popcorn that’s generously coated with fiery buffalo flavor. Sea Salt & Cracked Pepper Kettle Corn by KingOfpop.com in a 1.5 oz. bag delectable, handcrafted and lightly coated with sugar, drizzled with oil, and then rolled in sea salt and freshly cracked pepper. Roasted & Salted Peanuts by J&R Gourmet better than any ballpark peanuts you’ve ever tasted, roasted and salted to perfection in this 8-oz. bag. Spicy Cheddar & Veggie Cheese by Mountain View Cheese Co. Zesty spices and pieces of garden fresh veggies are speckled throughout classic cheddar cheese. Deli Style Hors D’oeuvre Crackers by Partners with sea salt and olive oil seasoning these are delicious crisp crackers that can be perfectly paired with cheddar cheese in this 2-oz bag. Honey Mustard & Onion Pretzel Pieces by Harvey’s Pretzels are delicious pretzels coated completely in a tangy honey mustard flavor in this 4-oz bag. Almond Nougat by Golden BonBon these 1-oz individually wrapped honey sweet nougat surrounded by premium California almonds. Chichester Snack Mix by Merrimack Valley Snack Company has a delightful snack mix comprised of crunchy pretzel nuggets, cheddar cheese crackers, and premium nuts. My Opinion: This is a nice gift tower for dad and it does have all his favorite snacks to enjoy. I like how organized the boxes are blue plaid which is very attractive. This is a gift dad will love and enjoy every day until it is gone.